FORTLAUDERDALE – Dr. Arthur Keiser, Chancellor of Keiser University, knows what employers are seeking to fill the skilled worker gap. West Palm Beach, Florida – September 2018 – For the past 40 years, Keiser University has focused its “students first” mission on developing career-ready individuals prepared to be responsible, accountable employees upon graduation. To continue meeting the needs of a dynamic workforce over the decades, Keiser administrators have sought the advice of thousands of industry leaders on what they want in an ideal employee. Today, Keiser University serves nearly 20,000 students across 21 campuses in Florida, as well as online and internationally. To say that Co-founder and Chancellor, Dr. Keiser is an ‘expert’ on the correlation between education and employment is an understatement. The latest employment statistics indicate that the chances of finding a good paying job are better now than they have been in decades, but many companies are not finding the type of worker they are seeking. “Rapidly changing workforce demands have created a large, “skills gap” between what employers need and what many job applicants can offer. That’s the gap Keiser University’s education model is helping to bridge by teaching not only the occupational degrees required for the position but also the professional – so-called ‘soft skills’ – needed to succeed in the workplace,” Dr. Keiser said. According to the U.S. Bureau of Labor Statistics, total nonfarm payroll employment rose by 201,000 in August 2018, and the unemployment rate was unchanged at 3.9 percent. Employment increased in professional and business services, health care, wholesale trade, transportation and warehousing, and mining. 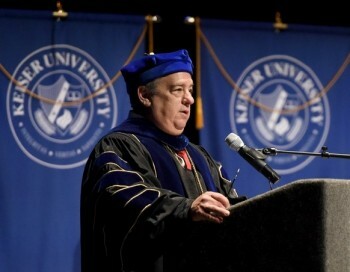 Keiser University primarily focuses on adult learners seeking career education degrees in these fast-growing industry sectors, including the allied health fields of nursing, physician assistants, sonography and radiologic technology, as well as business administration, information technology, criminal justice, and others. “Along with offering degrees from associates through doctoral levels, our curriculum helps students develop crucial personal and professional skills like critical thinking, communication, teamwork, punctuality, reliability, and leadership,” Dr. Keiser said. Professional and business services added 53,000 jobs in August and 519,000 jobs over the year. Health care employment rose in August by 33,000, with job gains in ambulatory health care services (+21,000) and hospitals (+8,000). Health care has added 301,000 jobs over the year. It is Dr. Keiser’s firm belief that employers who fuel our future are actively looking for skilled, well-rounded employees. Job applicants who have these highly sought-after skills will be the first to land competitive, higher paying positions.